New York lovers, Loan and Regis from California and France, had their official ceremony in Paris, with just a few close friends, followed by a beautiful outdoor ceremony in Mas de la Rose, Provence with guests from many parts of the world. In Paris, Loan and Regis got married at City Hall in front of the Mayor. This was very important for Regis who holds his French heritage closely. Loan wanted something small and intimate so it was perfect. Provence is where Regis took Loan on their first trip to France together. Loan loved that it was so different to Paris: simple, relaxed and beautiful. Mas de la Rose encapsulated all of this for them so after visiting a lot of venues they felt sure this was the right choice. They often visit his family in France, and dream of buying a house in Provence someday. They wanted to share the Provence experience with all their family and friends. It is lovely to hear their stories in the interviews in the Paris film, and then hear their personal vows in Provence. Oh, and check out Regis’ Michael Jackson moves! We had a lot of fun spending the day with these two in Paris. Such a lively couple and their city wedding was just so cool! 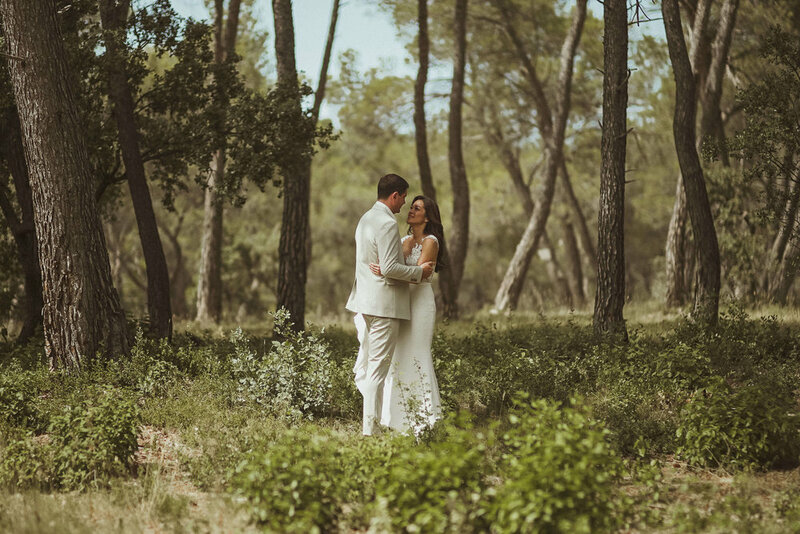 The stunning Mas de la Rose wedding was organised and styled by the talented and ever so lovely Aurelie of Love and Provence. Photography by our talented good friend Ben Higgins.